Hard work never killed anyone. What a load of rubbish, I’m dead on my feet here. For too long, we’ve been adding things to our “to do” list quicker than we cross them off. I can see a natural break coming up when we’ll have a moment to take breath and see where we’re at, when the vegetable patch is finished and planted up and the fencing constructed to keep in the two ewes with lambs that we’ve ordered but for the moment it’s madness. 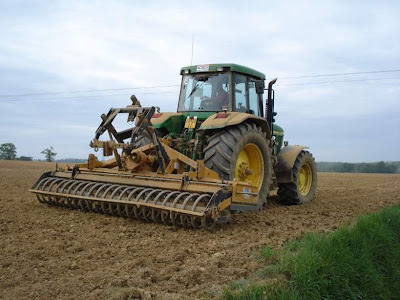 And we’re not the only one’s busy round here: all the farmers are desperately busy trying to get the soil prepared and crops sown, waiting their turn with shared machinery whilst keeping a concerned eye on the weather. I had Monday “off”, a much-needed break but there was also a reason to sit around. We’ve taken delivery of six geese late last week and it was their first time out on the grass, surrounded by the electric fencing, and I wanted to be on hand to free them, if they became entangled before they became habituated to it. One was also a bit under the weather and I wanted to keep a close eye on its state. My “work” for the day was therefore to sit on the new swing that we’ve hung under a large old oak tree, nursing a glass of wine and reading a book. It was a warm day and looking up at the different dappled greens of the new oak leaves with a clear blue sky behind was an absolute delight, as was listening to the contented chatter of the geese and hens, the cockerel crowing and wild birdsong. Which is to say, I think, that saving the planet begins with mutual respect and fostering good relationships in the community. I also get to understand how modern farming works and how technology, production, demand and prices all conspire to mean that Paul and his wife Christiane can afford to employ just one labourer to help manage a huge farm and are obliged to work seven days a week. In turn, he has offered to help me with our sheep fencing and the dismantling of the pigsties I told you about in the last blog. Both these favours involve the use of that huge tractor: I might be a permaculturalist but I’m not a Luddite!